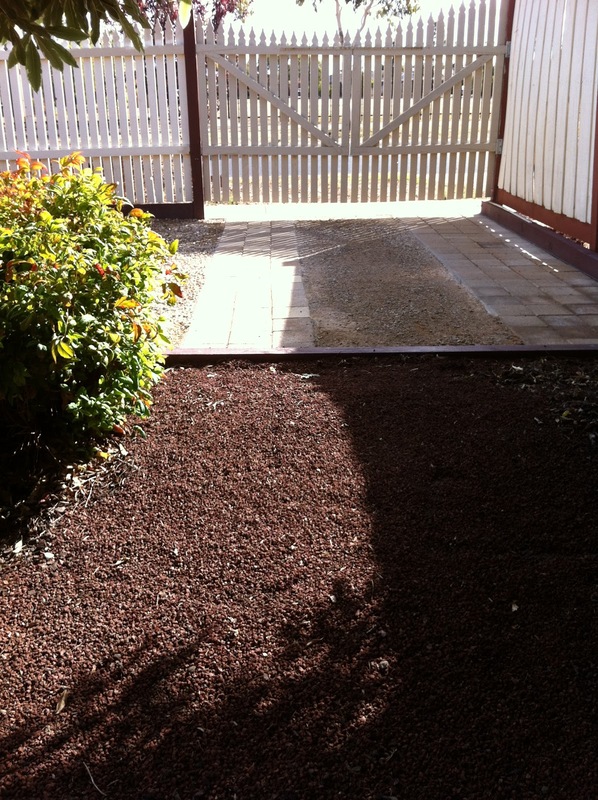 Living In The Land Of Oz: The Driveway is Finished - Well Done Hubby! This sign has been up on our front window now for many months. 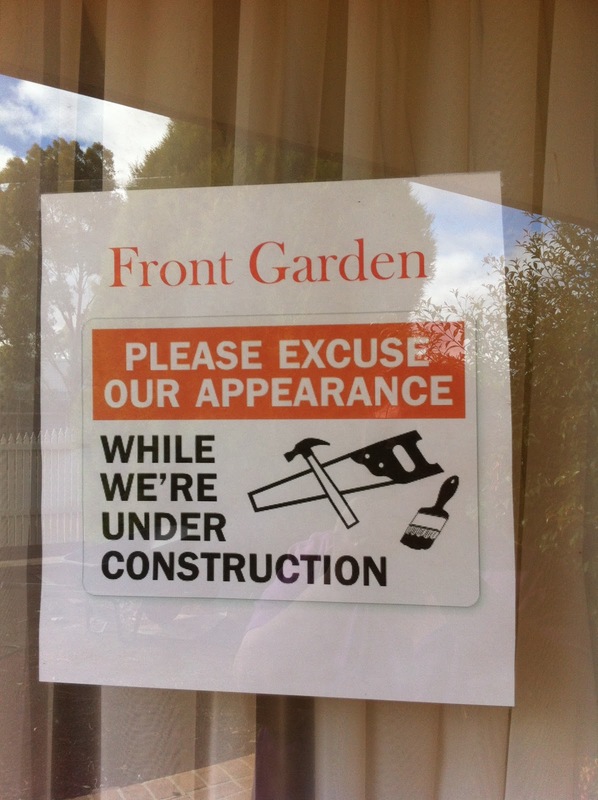 The front yard in under construction and I felt like I needed to apologise to everyone who came to the front door. We lost all our beautiful turf and garden during the drought and what we were left with is a rock hard slab of clay with almost 5cm cracks. I'd like to have had the money to just throw a landscaper at it and have it done quickly but we don't and so like most home projects, we do it ourselves with much sweat, tears and occasional swearing! This is the beautiful hardstand area that my hubby (with help from son and I) has made over summer and finished only today. We first had to make a panel of our front picket fence (isn't it gorgeous, we built that too) into a gate to gain access. The fence fully encloses the front yard except for a child proof gate. 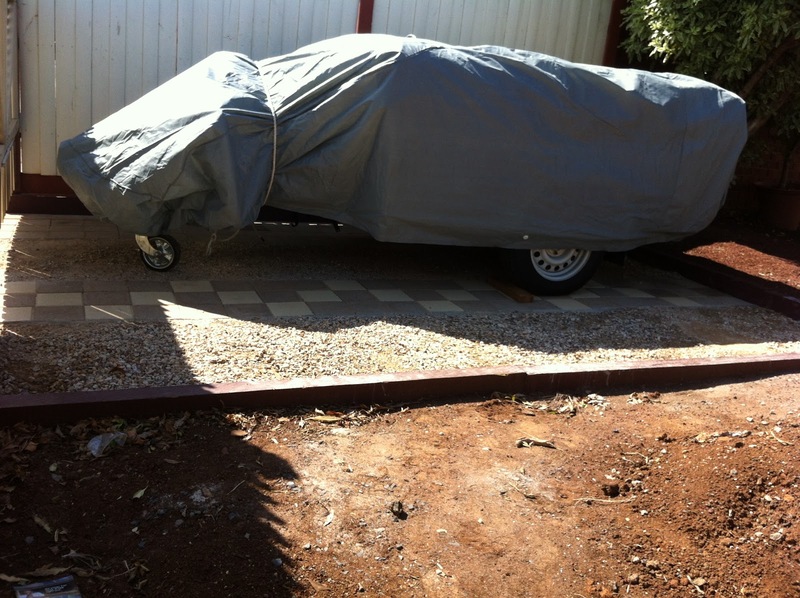 We built it when our son was 2 to keep him off the road and for some reason it was also built in the middle of summer with many days over 40C. I think we need to plan these projects a little better. The next step was to dig it out because like I said, its solid clay and we couldn't afford a bobcat or dingo so it was shovels and sweat. Our nature strip out the front has huge mounds of clay on it that I am sure impresses the neighbours and those who drive by. Unfortunately it will have to stay there until we can pay for someone to take it away. 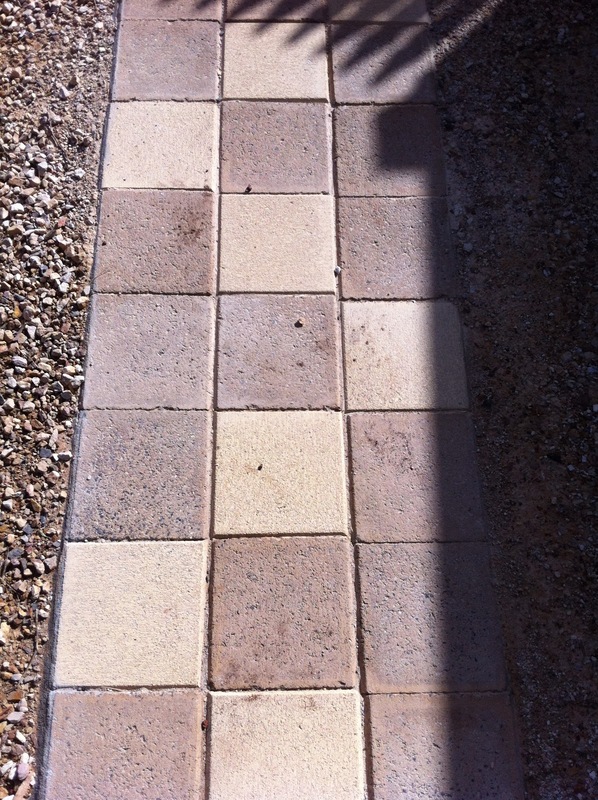 Hubby used mostly old pavers left over from another project he did down the side of the house many years ago. Because we were a few short, he created a pattern with the new ones. I think it looks great. 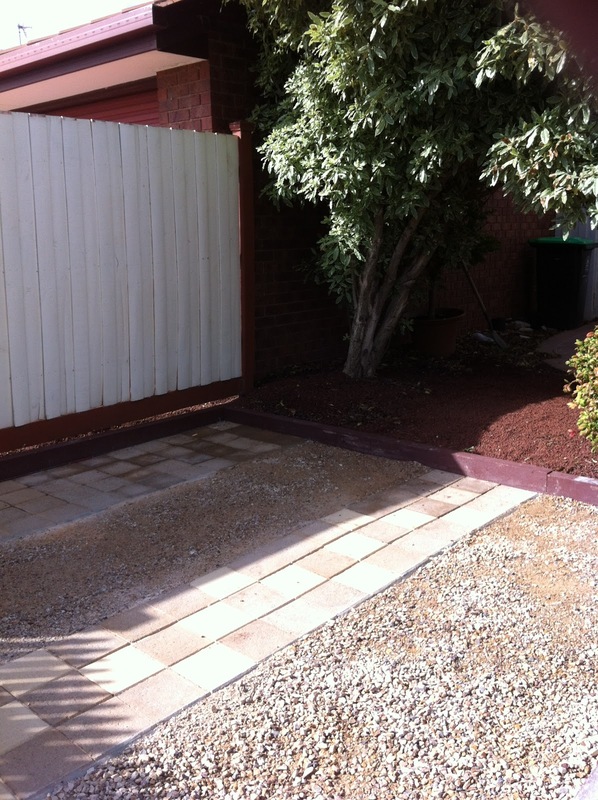 To save costs he only did two strips of pavers for the tyres and filled the rest in with Tuscan toppings. This area is only a storage area for our camper trailer currently occupying most of the garage and not intended for frequent use so it didn't have to take a heavy load. I think its a job well done on a budget and all it costs us was a few extra pavers, some sleepers, mortar and lots of muscle power. I hurt my foot using the shovel on the clay in the first few weeks and thereafter all i could do was hand him things and massage his weary muscles. Size - under the folded canvas tent is a full size inner spring queen mattress. All tucked up to bed and waterproof. 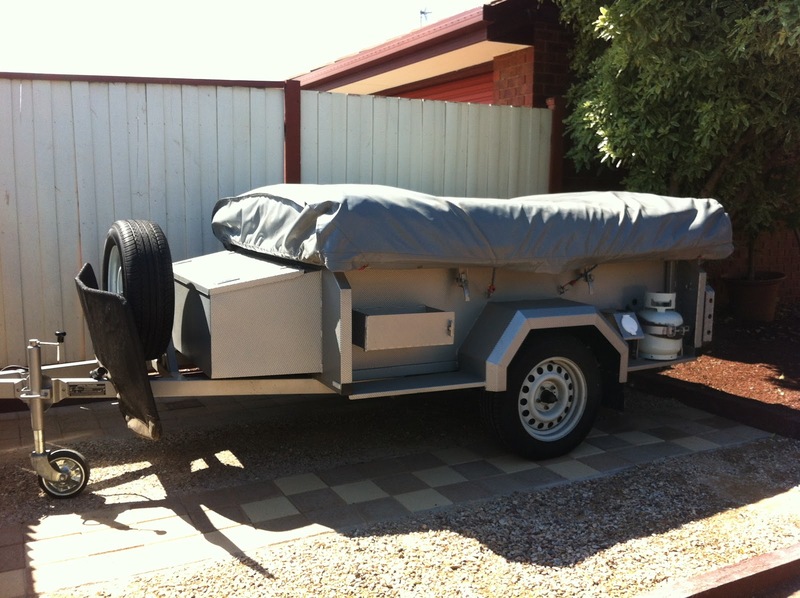 This is the camper trailer in position and with the new car cover. All weatherproof and hopefully seeing it there everyday will encourage us to think of more opportunities to get out there and use it. I'll post another time on our camping (or should i say "Glamping") adventures. The rest of the yard will be done as funds and time permits. Its likely to involve some a seating area, drought tolerant plants and a water feature. As it is fully enclosed with a high fence it is private and can be fully utilised given that I have taken the back yard for my vegie patch (another post). 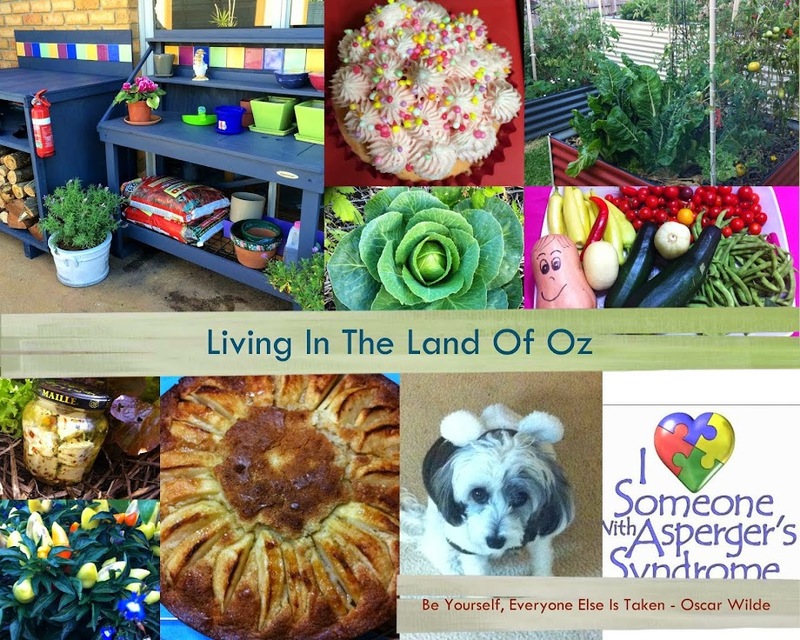 Thankyou for visiting Living In The Land Of Oz. Oh!!! Great job! I love the pattern too! It wasnt intentional. When we first costed the job, we were going to pave the whole area. At the time they were $3.20 each and so the job was too many $$$. When we went back to get another 25 they had changed suppliers and there was a whole new range for 95 cents each with lots of colors. Typical!